This gorgeous vase has a gold exterior with added real gold sparkles! The interior features various shades of blue, and to top it off it has a stunning purple lipwrap. 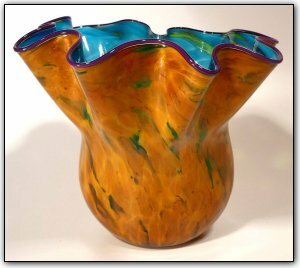 The vase measures 13" wide at the top and has an oval shaped base. Make sure to zoom in to see the full detail of both the sparkling outside and the luscious inside. And to think, this vase looks even better in person!